The idea of growth usually evokes positive images, yet when growth is disproportionate, it can be destructive. This is perhaps best illustrated in the growth of cancerous cells that can wreak havoc with the bodily functioning, sometimes even spelling its destruction. The normal growth of bodily cells contributes to the body’s functionality, but not their cancerous growth, which is essentially growth for growth’s sake. 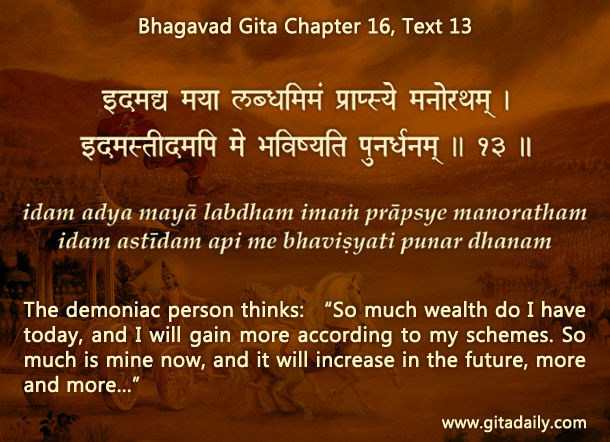 The Bhagavad-gita (16.13-15) outlines how obsession with growth, specifically financial growth, can be similarly cancerous. Those who make the accumulation of wealth the driving purpose of their lives often cast aside all other values in that uni-dimensional pursuit. On the altar of Mammon, they let their morality, sensitivity and even humanity get slaughtered as they stoop even to the level of murder. Being intoxicated with maniac desires for wealth, they feel no compunction in eliminating anyone who stands in their way – rather, they feel a devilish, sadistic glee in exterminating competitors one by one, till they can reign supreme. Wealth is a natural necessity of life, a necessity that is acknowledge in the Gita wisdom-tradition as one of the four purusha-arthas (meaningful goals) of life: dharma, artha, kama and moksha. All these four goals need to be pursued proportionately and harmoniously with life’s ultimate purpose of spiritual love, love for the supreme being, Krishna. When pursued thus, they are like the bodily parts that function synergistically. But when artha (financial gain) is pursued as life’s supreme goal, that growth becomes disruptive and destructive, akin to cancerous growth that destroys its host organism. By studying Gita wisdom diligently and by practicing bhakti-yoga determinedly, we can keep spiritual wisdom and spiritual experience as our guide in ensuring proportionate growth in our life – growth that leads to our overall individual well-being, both material and spiritual, and also to our optimal social contribution. Very nice explanation of the verse with an excellent example. By following the regulative principles of Bhakti one can maintain the homeostasis in material life to attain the spiritual path leading to Lord Krishna.